There's no need to buy expensive punches or dies to make this string art Christmas card. Just print out the pattern onto card stock (see link below), cut and go. 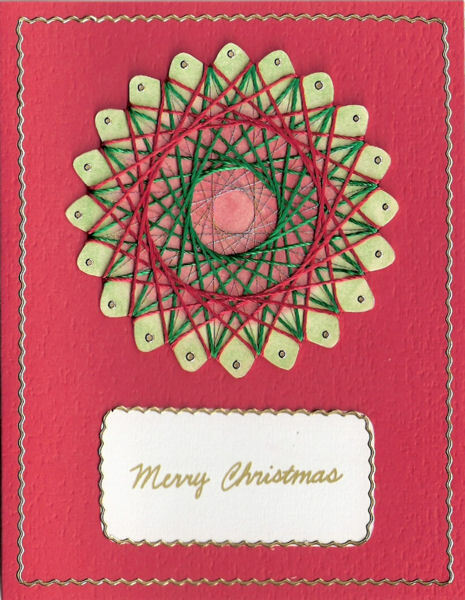 For this card, I printed the string art pattern onto beige card stock and chalked one of the shapes with red and green chalk. I then cut it out and wrapped it in metallic thread and green and red embroidery floss. I added gold peel-off dots to each point. Red card blank 4.25" x 5.5"